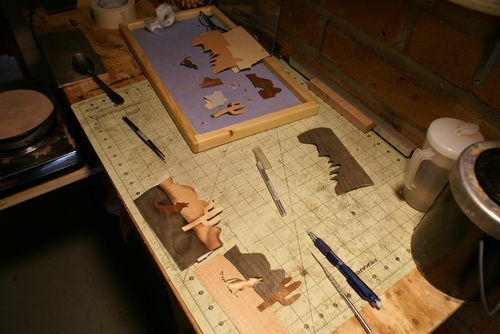 My First Exercise In Boulle Marquetry #1: A Day With The Shipwright! I spent the day with Paul Miller yesterday and got my first taste of Boulle Marquetry. I have been interested in marquetry for about 4 years now. This was a huge learning experience. The Chevalet was very intuitive to use. 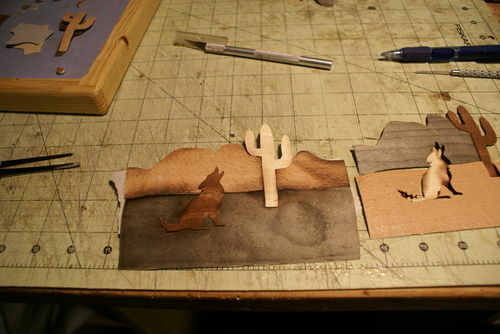 I found it pretty easy to stay dead on the lines (this speaks more to the fact that this was a simple exercise and an excellent tool than any kind of skill I might possess, those tiny details in the coyotes tail were the most difficult part to cut). 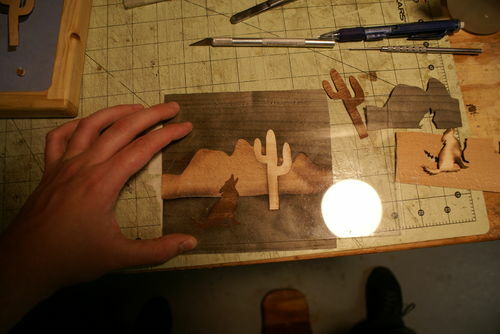 Sand shading and then assembling panels. Normally these would be assembled on an assembly board with hot hide glue, but because these are pretty small panels we just used masking tape. The tray that holds all of the pieces after they are cut is at the top. The gaps are from the saw kerf. They will be filled in with mastic. The hardest part for me was sand shading. Top left photo was the first I shaded, then top right, then bottom right, and finally bottom left. I felt like I was starting to get the hang of it on the last panel. I found out I really like the spoon shading technique. 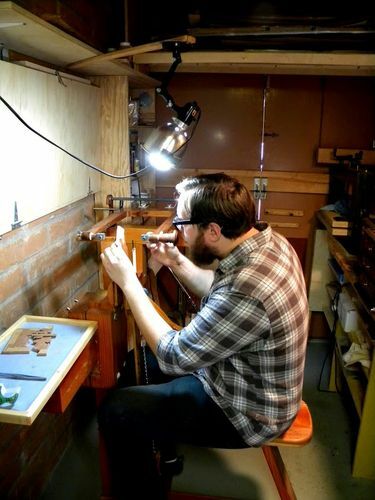 I learned a ton from Paul and I got to see the progress he has made on his jewelry box. It is absolutely stunning in person. I would like to thank Paul for his hospitality, knowledge, willingness to teach, & patience. I had an incredible time and learned so much! Thank you! It was my pleasure Luke. You were a great student. You will get a huge boost from the course at ASFM. Thank you very much Paul. I look forward to the next time we can get together! Have a safe trip back to Canada! Luke, good for you. 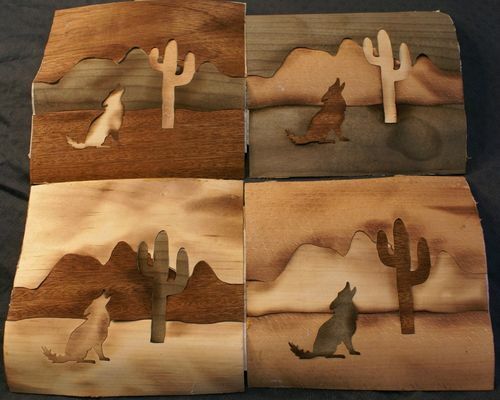 I don’t know Paul personally (we’ve never met), but through this site and other woodworking sites, I have followed his work closely, and I can truly say he is a true craftsman and artist. His work always, blows me away, and on top of that he is a great person and shares his knowledge of woodworking with those around him. Congratulations, Luke. You Steve probably can not be anticipated in the magical world will take a step with this beautiful craft! Have a nice work in the future.